A child dreams of inventing a new marble and having the recipe appear in the Book of Marbles. In a chaotic lab, with a sheep as an assistant and using ingredients as diverse as 'teeth bling from a retired rapper', 'three pints of swooshy night air' and 'a snippet from a sheep's fringe', the child lights up the stoves and, with a bang, marbles that have never been seen before rain down. 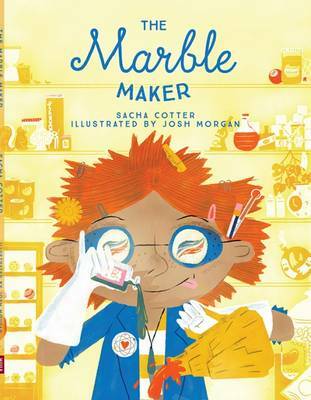 Sacha Cotter is a teacher and writer. Her first picture book Keys/Nga Ki was a finalist in the picture book category (Keys) and the Maori Language Award (Nga Ki) of the New Zealand Book Awards for Children and Young Adults 2015, and Nga Ki won Te Tohu Taurapa Award in the LIANZA Children's Book Awards 2015 and was selected for the IBBY Honour List in 2016.